I wrote yesterday about the media effort to help the Obama administration cover up the Benghazi scandal. That scandal includes at least three elements: 1) the administration’s failure to provide adequate security for our personnel there, even after they had requested heightened security; 2) the administration’s attempt to deceive the American people about the nature of the Benghazi attack, by falsely characterizing it as a spontaneous mob uprising prompted by a YouTube video; and 3) as of the last two or three days, the administration’s alleged refusal to provide military reinforcements for the tiny handful of operatives who tried to fight off a much larger force of terrorists, two of whom were eventually killed after help failed to arrive. Incredible as it may seem, the Times is trying to ignore the charge that the Obama administration rejected calls for help from embattled troops on the ground in Benghazi. Is the Times always so reluctant to cover a foreign policy scandal in the last days of a presidential campaign? Well, no. It depends entirely on which party is in office. Cast your memory back to October 2004, when George W. Bush was running for re-election against John Kerry, and the Times was trying to help the Kerry campaign any way it could. Eight years ago, the Times fabricated a foreign policy “scandal” out of whole cloth and pushed its faux expose relentlessly, in hopes of unseating a Republican president. The Times’s now-forgotten cause celebre of 2004 was called al Qaqaa. Al Qaqaa was a place in Iraq where, among other things, there was an ammunition dump. The Times claimed that American soldiers had carelessly allowed a substantial quantity of munitions to be looted or stolen from al Qaqaa. Given conditions in the immediate aftermath of the Iraq war, it would not be surprising if munitions disappeared from a variety of locations; in addition, it appeared likely that some or all of the explosives in question had been removed from al Qaqaa prior to the war by Saddam Hussein’s government. But the Times was on a mission to use al Qaqaa to discredit the Bush administration. In October 2004, a Times reader would have thought that al Qaqaa was the most important news story in the world. On October 25, eight days before the election, the Times headline screamed: “Huge Cache of Explosives Vanished From Site in Iraq.” The story carried the bylines of three Times reporters and went on just about forever. The next day, Paul Krugman tried to connect the dots in a column titled, A Culture of Cover-Ups. Al Qaqaa, in Krugman’s telling, was emblematic of the entire Bush administration. It is somewhat ironic, in retrospect, that the Bush administration made no attempt whatsoever to cover up anything having to do with al Qaqaa, but rather was bewildered by the Times’s irrational assault. On the other hand, the Obama administration unquestionably tried to cover up what happened in Benghazi with its YouTube video excuse. Krugman has been silent, of course. White House officials reasserted yesterday that 380 tons of powerful explosives may have disappeared from a vast Iraqi military complex while Saddam Hussein controlled Iraq, saying a brigade of American soldiers did not find the explosives when they visited the complex on April 10, 2003, the day after Baghdad fell. But the unit’s commander said in an interview yesterday that his troops had not searched the site and had merely stopped there overnight. The horror! The next day, October 28, the Times barrage continued with “4 Iraqis Tell of Looting at Munitions Site in ’03.” They didn’t tell much, actually, but that didn’t stop the Times from continuing to pump up its purported scoop. The paper seems to have taken a day off on October 29, and then returned to the al Qaqaa beat in force on October 30, three days before the election. The report that hundreds of tons of high explosives are missing from the Qaqaa munitions facility in Iraq has loomed over the last week of the presidential campaign, and led to a blur of charges and countercharges about what actually happened, and why the news came out so close to Election Day. Senator John Kerry has seized on the news, first reported by The New York Times and CBS’ “60 Minutes,” to reinforce his argument that the Bush administration bungled the postwar occupation of Iraq. Of course he did! That was the whole point. The Post also reports the administration position that 400,000 tons of the estimated 650,000 to 1 million tons of Iraqi munitions have been destroyed or will be destroyed. Obsessing about the missing 380 tons, the story implies, is obsessing about decimal dust. Once the election was over, no one heard anything more about al Qaqaa. The Times, which had been obsessed with the story until 48 hours prior to John Kerry’s defeat, shrugged it off once there was no more partisan purpose to be served. In the end, no one actually cared about a small quantity (relatively speaking) of munitions that may or may not have disappeared from one of many Iraqi sites. The whole thing was a put-up job by 60 Minutes and the New York Times, which had hoped to help sway the election in John Kerry’s favor. Now contrast that history with what is happening this year. By any rational standard, the Benghazi story dwarfs al Qaqaa by several orders of magnitude. An American ambassador is dead, along with three other Americans. The administration has been caught red-handed, lying about the nature of the attack on the Benghazi consulate by describing it as a spontaneous mob action when the administration knew it was a carefully planned terrorist attack, scheduled for the September 11 anniversary. And it is now being reported that valiant Americans went to their deaths because the Obama administration turned a deaf ear to their calls for help. Al Qaqaa, by comparison, was what some of our readers call a nothingburger. 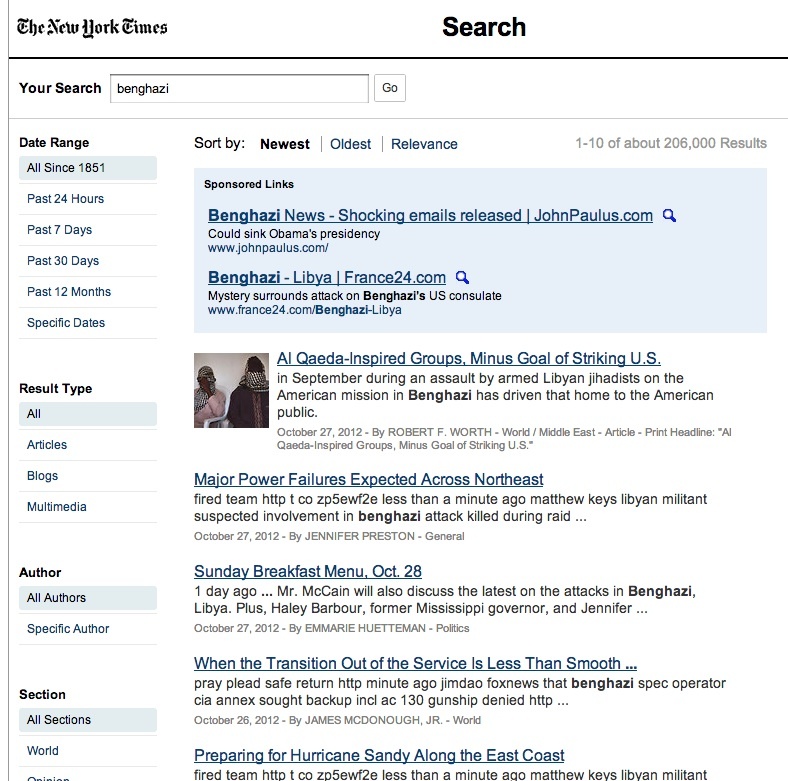 Yet, while the Times played al Qaqaa for everything it was worth in 2004, it has tried to cover up the infinitely more significant Benghazi story. The inescapable conclusion is that the New York Times is not a serious news source, but rather is an organ of the Democratic Party. Whether the Times covers a story or not has little to do with the importance of the story, and has much to do with the partisanship that suffuses the newspaper. This is why intelligent news consumers have zero respect for the New York Times, even though individual reporters there sometimes do a good job.